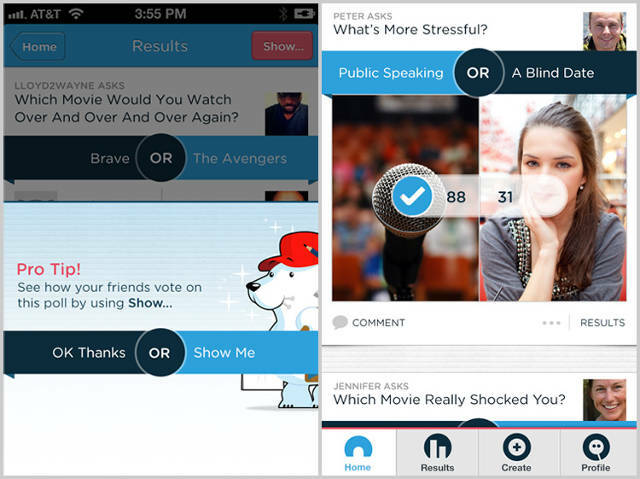 When we first wrote about Polar, an addictive app that invites you to make and take “this or that”-style quizzes, we called it “an object lesson in mobile design done very, very right.” Luke Wroblewski, the mobile-first design evangelist behind Polar, tells us four winning strategies he used to supercharge Polar’s user experience. If you want people to actually engage with your mobile app, not just download it and forget it, read on and take notes. No one is paying full attention to your mobile app. The sooner you swallow your pride and start designing for this fact instead of against it, the better off you’ll be. “Effective mobile designs not only account for these one thumb/one eyeball experiences but aim to optimize for them as well,” Wroblewski writes. How often do you download an intriguing-sounding app, only to be confronted with a screen full of boxes to fill out before you can even launch it? We’ve learned to expect this, but it’s fundamentally bad UX. “With Polar, we take the opposite approach: from the moment you download and open the app, we let you get in and start using it,” says Wroblewski. The result? Instant engagement: “88% of people who downloaded Polar used it to vote,” he says. Polar holds onto your voting activity so that if you do decide to go back through the registration process, your votes carry over into your account. “61% of people take this next step and sign up,” Wroblewski adds. This process, called “gradual engagement,” “is kind of controversial,” Wroblewski admits. If you don’t force users to jump through registration hoops, many of them won’t—and the metric of those registrations will go down. But consider, says Wroblewski, which kind of user you really want: someone who fills out a form once and then never uses your app again, or someone who uses your app a lot, and then fills out a form because they actually want to? It’s another controversial move: instead of obscuring passwords behind asterisks as you type them in, Polar leaves them visible. Is it a crime against the security gods? “There is a lot of baggage and expectations about what a ‘secure’ login form looks like,” Wroblewski says. “But what happened was the exact opposite. I heard from a lot of people that they loved the approach.” Polar isn’t alone: Yahoo and Sprint have experimented with visible passwords in their login forms with no detrimental security effects—and happier users. Polar has one core interaction (voting on a binary choice), and one primary pattern for delivering it (splitting the screen in half to represent each choice, and separating them with a big round “OR” in between). It’s a simple enough interaction to learn. But the point, Wroblewski says, is that users still do have to learn it—so once you’ve gotten the user past that energy barrier, you might as well let them keep using what they’ve learned as often as possible. “We reuse our core interaction for logging in, for tips and help dialogs, for responding to error messages and more,” Wroblewski explains. “The idea is to use this pattern all over the app, to get people to features and functions that would otherwise be hidden several layers deep.” Apps that echo core interactions feel more “intuitive”—that mushy placeholder word that usually just means “familiar.” If you make something easy to learn once, and then let users use it over and over again to do other things, the “language” of your app will feel familiar and legible—fast. “Pretty much all our attention and effort [for building Polar] went into these interactions because they are at the heart of collecting and sharing opinions,” Wroblewski says. “If we didn’t do a good job with them or if nobody cared enough to vote or make polls, the whole concept I just outlined would fall apart.” But the beauty of these strategies, he says, is that they can be implemented no matter what your mobile app is or does. Will they turn a terrible app into a successful one? Probably not. But if you’ve got a mobile design that you believe in, putting these ideas into practice could go a long way towards making your users believe, too.